Societies consider certain institutions and activities as central, proper, and visible, while others are defined as peripheral, deviant, and private. 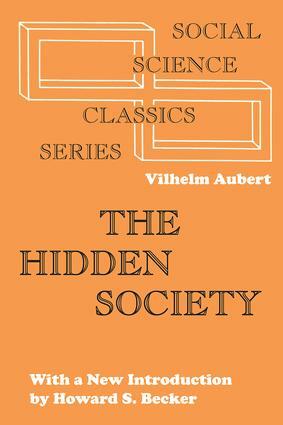 Vilhelm Aubert takes us to the ""hidden"" societies: the privacy of love, the secrecy of the underground, the remoteness of a ship, the isolation of the ill, the retirement from social life into sleep, and similar fascinating topics.Vilhelm Aubert, a professor of sociology in the Law Faculty of Oslo University and a member of the board of directors of Oslo's famed Institute of Social Research, presents a theory of the hidden societies, a theory concerned with concepts such as time and space, causality, will, and' chance. Chapters on predictability and chance deal with lack of 6rder, with phenomena that appear meaningless or absurd from a point of view very prevalent in modern life. We are presented with a study of isolation as a sociological phenomenon - accepted or fostered by social action - and we see how the existence of lonely, private niches in a society serves, consciously or unconsciously, to satisfy-idiosyncratic needs of individual personalities.